In Japan I was often ask about how to get more people to bike. Unsurprisingly, safety is the main concern. If people feel safe they are perfectly happy to bike - and to let their children bike. So is the answer bike lanes, bike traffic lights etc.? Absolutely. And they lead to the best - free - solution: Numbers. The more people who bike the safer it gets. We know by instinct that there is safety in numbers. 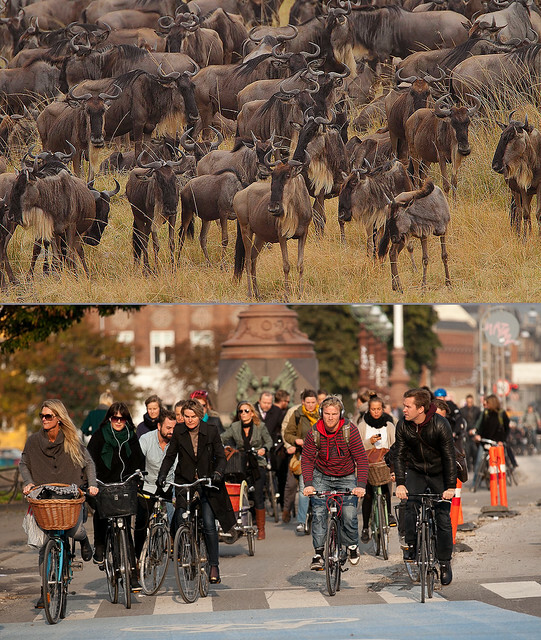 True for Cyclists in Copenhagen as well as Wildebeest in West Tsavo. And our instincts are backed by statistics and science. Even in Copenhagen we have seen the number of accidents drop as the number of cyclists rises. Cars are the real danger. Their big, bulky steel structures do not mix well with cyclists. In Japan the drivers are very considerate towards cyclists - if they see you. But often they do not because they are not used to bikes. In Denmark drivers are used to keeping a watchful eye open for cyclists from all sides. And doing so is essential for anyone trying to get a driver's license. Take care and happy cycling! I wish everyone of and at 'Cycle Chic' a merry Christmas and a joyful 2012. Errr.... I mean 'Interesting juxtaposition of photos! Agree with the text of the article. But the driver of a bicycle also has a responsibility to others. And reducing one's awareness by wearing headphones while riding not only reduces safety, but also helps to entrench anti-bike sentiment not just in Copenhagen, but everyone who reads this blog around the world. i wish more people cycled in the States. 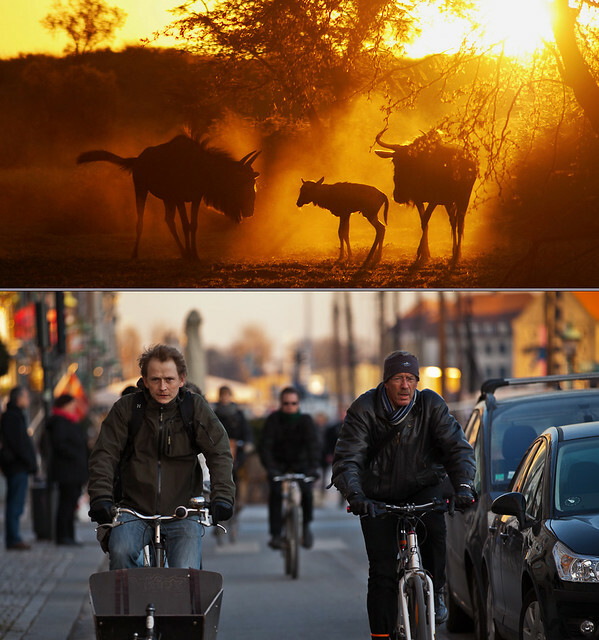 great photos of herd safety! Safety, indeed, has to do with numbers. 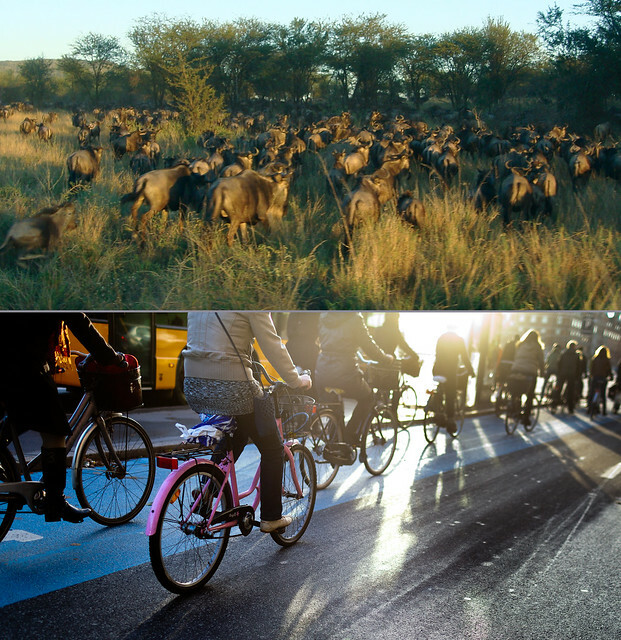 Wildebeest and bikers alike. 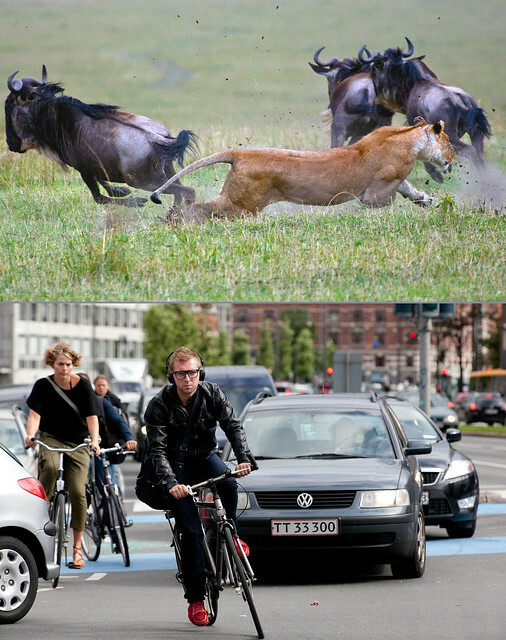 Unfortunately Wildebeest sometimes drive cars. And then you can have a problem. In Barcelona we are getting smarter but we have a long way to go yet.